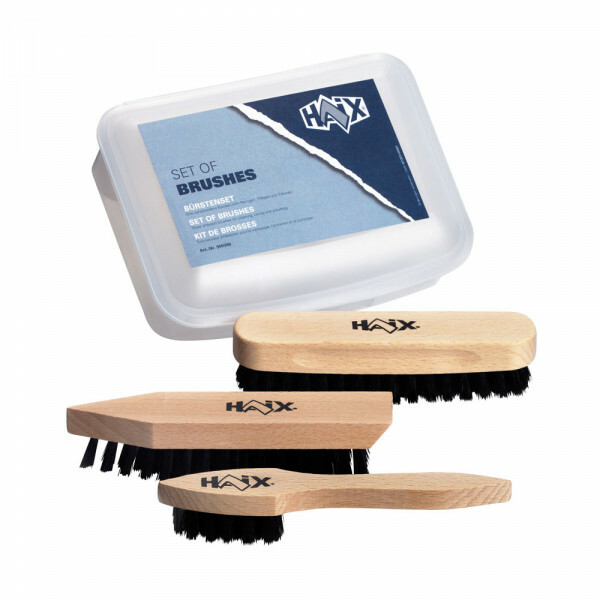 Product information "HAIX Set of Brushes"
Cleaning, care and polish. There is the right tool for each of these tasks. The HAIX brush set in a practical box. The high-quality brushes in three different sizes make shoe cleaning a lot easier. The large pointed shoe brush with hard bristles removes coarse soiling. The upper material and the sole of the shoe can be cleaned quickly with the large cleaning surface. With the narrow pointed surface, you easily enter the small corners and grooves of the shoe. Use the small brush to apply the nourishing shoe polish to the smallest folds of the shoe. The soft bristles of the large polishing brush ensure that even smooth leather shoes get their old shine again. The shoe cleaning set from HAIX is always there. The set is easy to carry thanks to its sturdy box. Shoe care is not only responsible for a spotless optics. The water-repellent and breathability properties of your boots will be tested during extreme situations. With an impregnating shoe cream, the suitability of your shoe will remain at the usual high level. The storage in a box is also a great advantage. Even within your own four walls, everything is ready to use.